The Champ de Mars is a large green space on Paris' Left Bank. On one end, at the river, is the Eiffel Tower. At the other end is the Ecole Militaire complex, built under Louis XV in the eighteenth century. In between, large lawns are bordered by wide walkways, gardens, and long allées of shade trees. One of the allées that runs the length of the park. The big lawns are to the right, outside the photo. 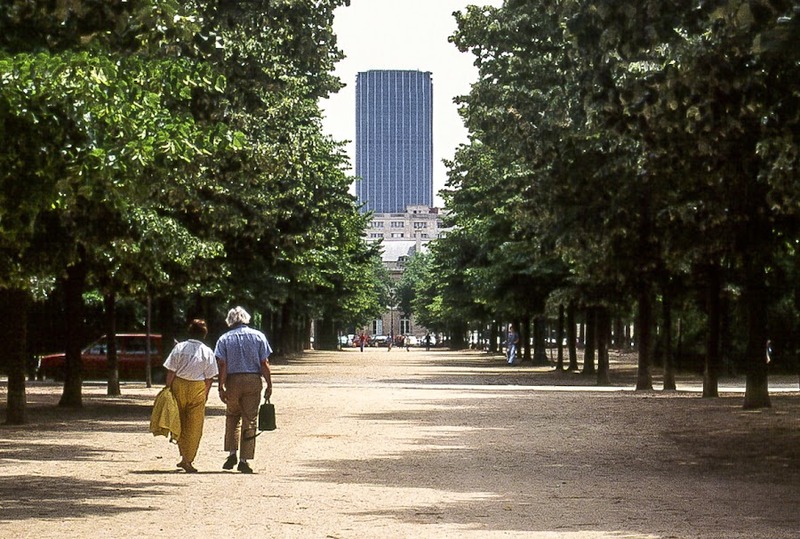 The tall building in the photo is the Tour Montparnasse whose northwestern facade faces the Eiffel Tower. The two towers don't line up perfectly, but just enough to make for some interesting views through the trees. This is a detail of the church of Saint Eustache in central Paris. The current building was "completed" in 1754, a rehab of the building that was constructed in the sixteenth and early seventeenth centuries. The church's south tower was never finished. 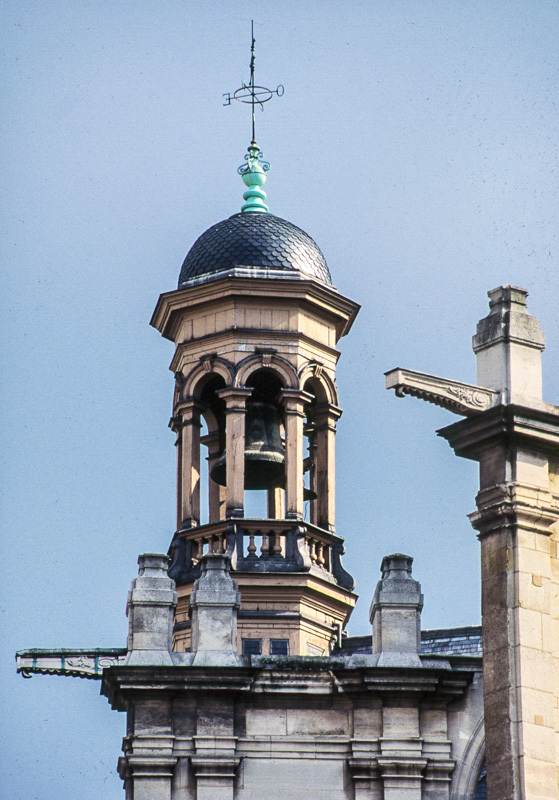 This bell tower is atop the roof of the Chapelle de la Vierge (Chapel of the Virgin) behind the altar at the eastern end of the church. Based on the orientation of the weather vane, I must have taken this picture from the rue Montmartre. The church is right up against the old Quartier des Halles, the central market halls of Paris, until the market was relocated to Rungis out near Orly Airport and the halles were demolished in the 1970s. For years (including 1981 and 1982 when I lived there), the church was on the edge of a huge construction site and not particularly accessible. Now the area south of the church is a large open space with great views of the building. This is the Colonne de Juillet in the middle of the Place de la Bastille. 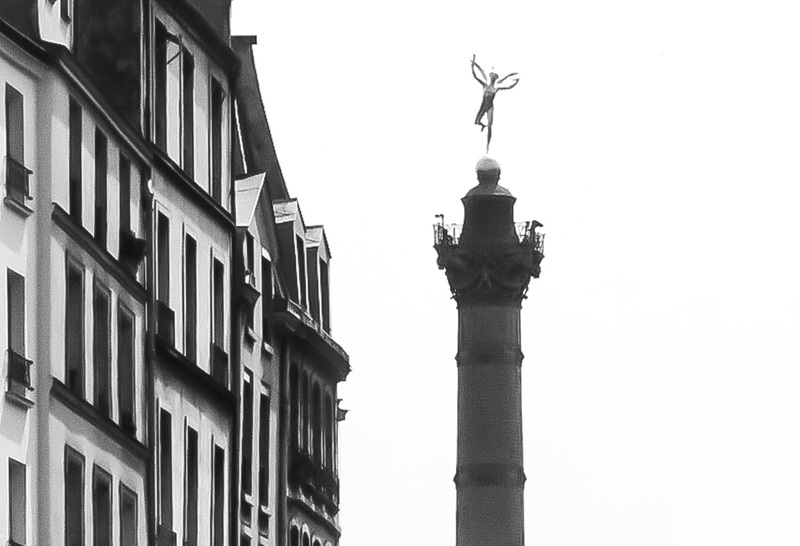 The column was completed in 1840 and commemorates the revolt against Charles X in July 1830. The winged statue at the top of the column, covered in gold leaf, is called Génie de la Liberté (translated as "Spirit of Freedom"). You have to imagine the column's green oxidized bronze and the brilliant gold of the statue on top. The original color slide is much longer vertically, showing the street (la rue Saint-Antoine) filled with cars. I thought that cropping the photo this way makes it more dramatic, highlighting the statue rather than the cars in the street below. Although, I like that version, too. I found and messed with another one of the old Paris slides, so my speculation on Friday about being done was premature. Ha. The pyramid entrance at the Louvre was relatively new back when I took these shots, and the rehab of the Richelieu wing of the museum had just been completed and I wanted to see it. I took a bunch of photos around the glass pyramids and this is one of them. It looks like it's leaning to one side, doesn't it? I tried to fix it. 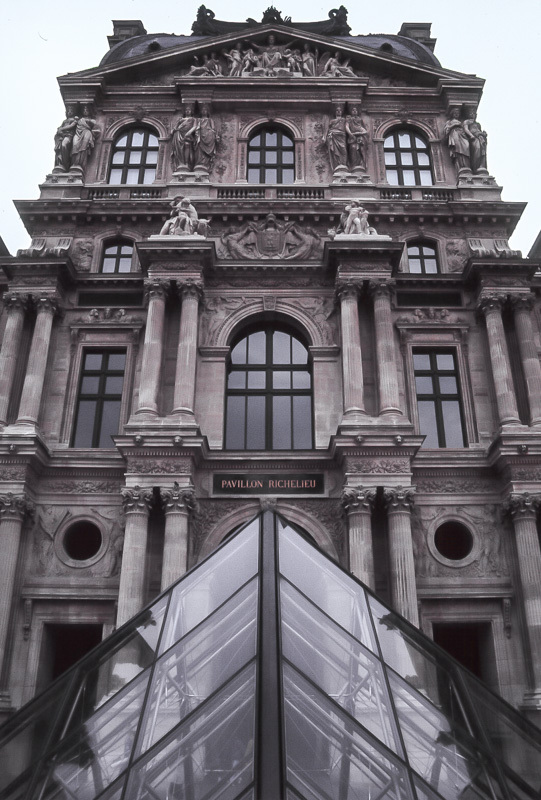 I've been into the Louvre several times, but I know I haven't even seen half of what there is to see. Back in 1981 I saw the biggies: Mona Lisa, Venus de Milo, Winged Victory, and all that. I've seen the excavations of the foundations of the medieval Louvre castle. I've wandered through the Egyptian antiquities section. And, of course, the sculpture hall and galleries of the Richelieu wing (though not all). This week's cover features Julie Gayet, an accomplished actress and producer. She's done a lot in film and television, and is interviewed for the magazine this week. Also, Sylvie Vartan. Her cover quote: "With me, it's all or nothing." She's a singer from the sixties, but she's currently in a play in Paris with Isabelle Mergault. Robert Redford, a free man. Was he ever not? I know it seems that the tv people pick on American disaster and sci-fi movies as duds. But there are plenty of American (and other) films on during the week that get very good reviews. Still, the US does produce a lot stuff, so it stands to reason that there's a lot of bad stuff out there, especially when you include low-budget, made-for-tv stuff that's probably inexpensive enough for these cable channels to acquire in quantity. San Andreas magnitude 10 (San Andreas Quake). American made-for-tv movie. Directed by John Baumgartner, 2015. With Jhey Castles, Jason Woods, and Grace Van Dien. ► A seismologist predicts a large-magnitude earthquake in California, but no one believes her. A mediocre screenplay, no direction, actors who seem lost, and failed special effects are all on the menu for this stinker. For adults and kids over 10. 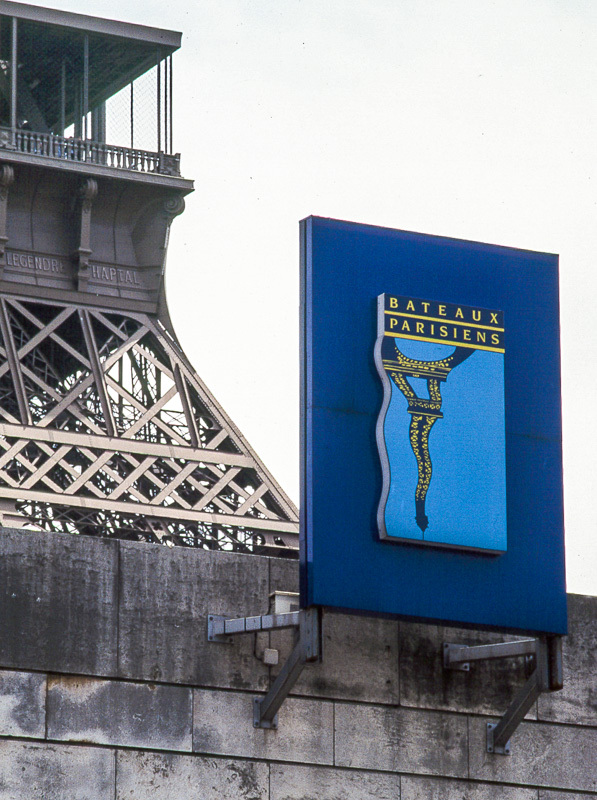 I think my series of old slides from Paris has run its course. There are a bunch more scanned photos, but when I look at them I feel uninspired. I think I've already posted the best of them. Still, you never know when one or two more will pop up over time. The top floors of the Pompidou Center and its iconic escalator. This is a view of the Centre Pompidou, home of the Paris modern art museum, from the top of the Notre Dame cathedral's bell tower. The original photo was overexposed so a lot of the detail was lost. But with Lightroom software, I've been able to bring it back to life. I like it much more now. I first visited the museum in 1981, but I don't have much of a memory of it. The last time I was inside was in 2011, and I really enjoyed it. The views from the escalator, terraces, and other spots inside the building are nice and almost worth the price of admission themselves. Click here to scroll through the series of photos I posted from the museum in 2011. We had some fog on Monday morning. When I looked out the window before our walk, it looked pretty thick. Once outside, I noticed that the fog layer wasn't thick at all; I could see blue sky if I looked straight up. But there was enough fog close to the ground to reduce horizontal visibility. I could see the sun rising up orange through the fog. 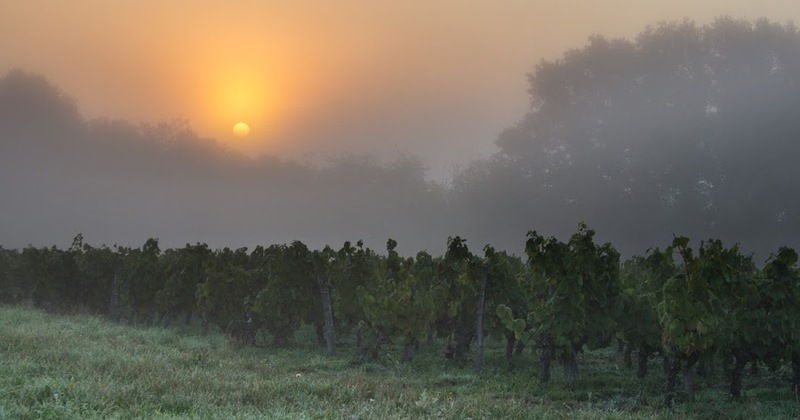 Monday's sunrise over the vines. Grape harvesting has wound down. There was a frenzy to get everything in just before, and just after, that big rain we had last week. I saw two harvest machines out back yesterday, and there are still some grapes to be picked, mostly the late-harvest whites and one plot of black (red) grapes that I know of. The weather is changing and the vineyards are taking on their first hints of fall color. 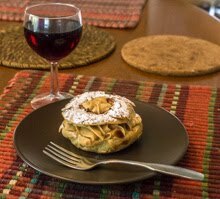 I have often heard people visiting Paris wanting to go off the beaten path and find that perfect little restaurant that nobody knows about. From my experience, all paths in a city as big as Paris are beaten, and if nobody knows about a restaurant, it goes out of business really fast. Cities are filled with people, and it's ok to be a tourist. What you really should be looking for is a place that matches your tastes and that you feel comfortable in, tourist crowds or no. That said, it's also good to slip out of your comfort zone from time to time, but that's a subject for another blog post. Le Champ de Mars is in a very nice residential neighborhood within walking distance of the Eiffel Tower. This place, the Champ de Mars in the Seventh Arrondissement, is very close to the park of the same name, the Ecole Militaire, and, as you can see, the Eiffel Tower. It's a big place with great sun exposure and a terrific menu that's reasonably priced (or used to be; still, it's not cheap). 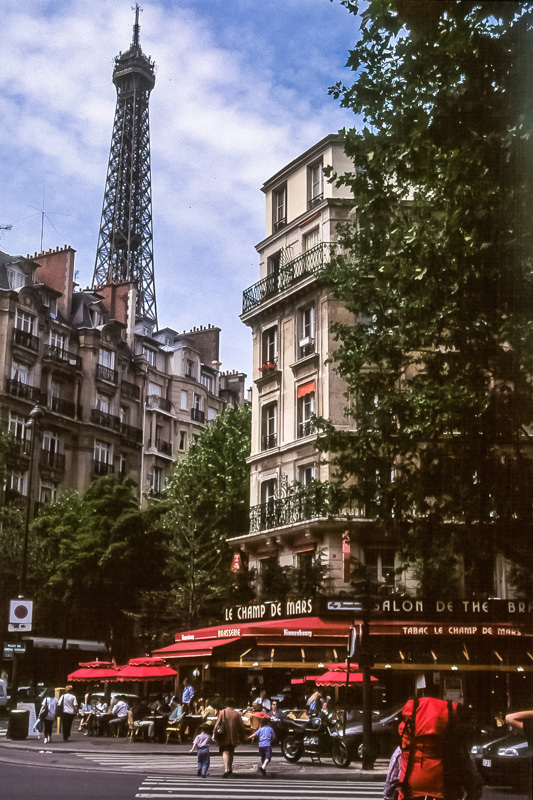 Even though it's often filled with tourists, the Champ de Mars is an authentic Parisian brasserie/café that serves a robust Parisian crowd, and I've enjoyed many great meals there. The people watching can't be beat. If anyone has been recently, I'd love to hear what you thought and what it's like these days. This photo didn't turn out the way I had hoped. I should have moved around some more for a better angle. But, still, I like the imagery of the tower, graphically depicted as a reflection in the river, juxtaposed with the actual tower. I wonder if this sign is still there after all this time? The sign is for a company that runs boat tours along the Seine River. Today I am in the clinic at Blois. I'm having a routine exam, one that I had for the first time five years ago. They will put me under a light general anesthetic for about fifteen minutes. It will be a nice nap. I'm already looking forward to eating vegetables again once it's done. I don't remember exactly, whether it was 1988 or 1989, when Ken and I climbed up to the top of the bell tower at Notre Dame cathedral in Paris. I had been up there once before, in 1981, but haven't been since. 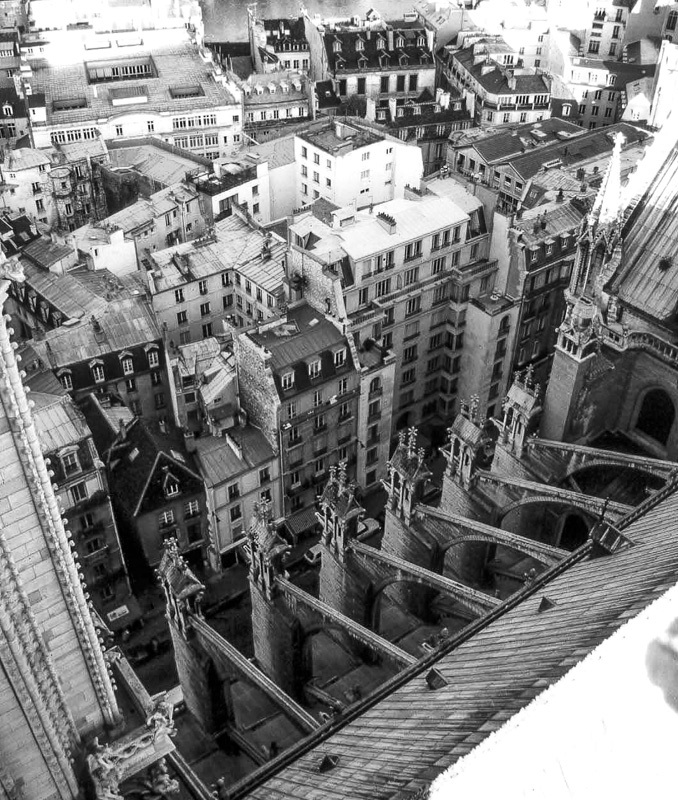 Because the cathedral is smack in the middle of the city, the views of Paris from the top are amazing, and I took many photos that day. 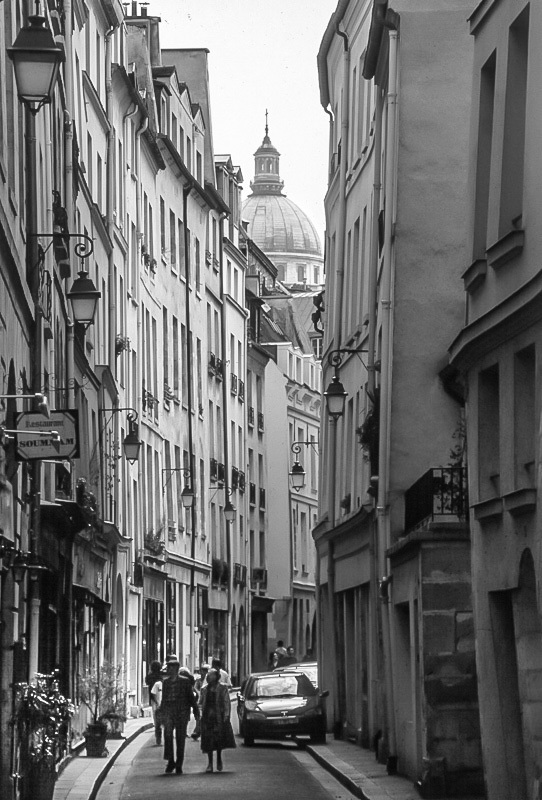 But this is one that I particularly like, looking down into the rue du Cloître Notre Dame. Flying buttresses supporting the north wall of the cathedral, between the bell tower and the transept. I think I could safely say that this is one of the most photographed cathedrals in the world, although I can't find anything on the internet to verify that. Paris is the fourth most photographed city, according to one source, and the Church of the Good Shepherd in New Zealand is supposedly the most photographed church (not cathedral) in the world. I can't fathom how such things are calculated. 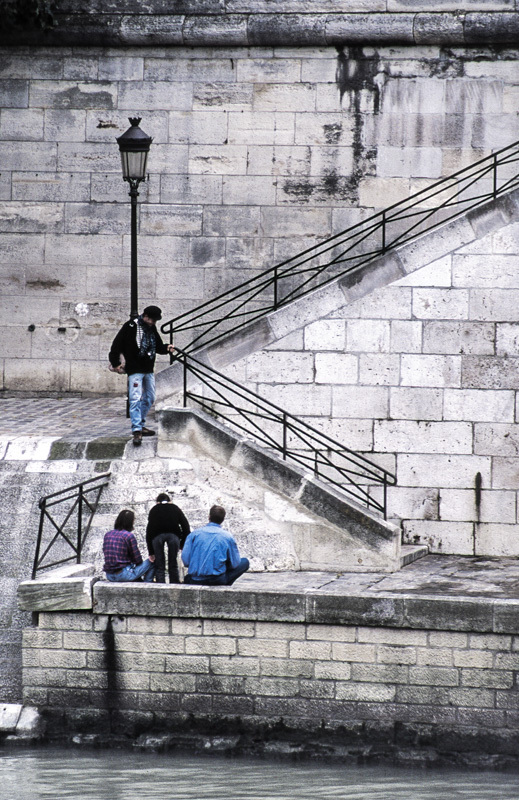 I'm continuing with Paris photos from around twenty years ago. You may recall that I scanned some of my old color slides a while back for the blog. I used a now ten-year old (or more) version of Photoshop for the scanning. I was just learning how to use it; I did minimal processing and saved the photos in a small format. Now I've got Lightroom and a little more experience with post-production, not to mention more column-width on the blog, so I'm trying to give new life to these old images. Looking west (down river) with the bridge's central arch on the left. This is one of the elevated sections of the Paris Métro transit system. 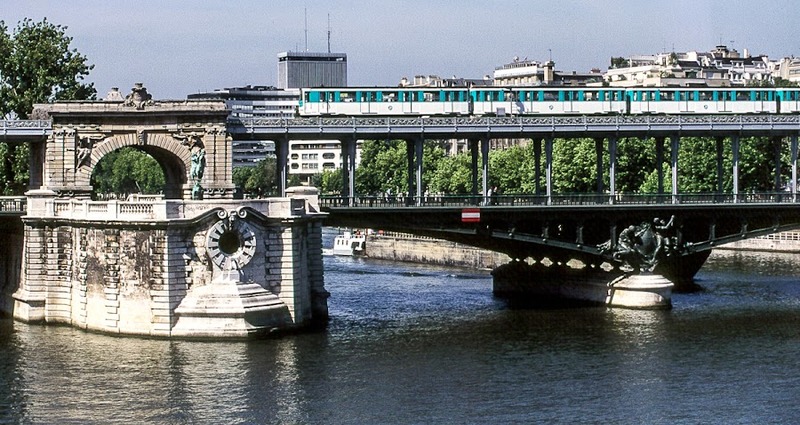 It's the Number 6 line (Charles de Gaulle/Etoile-Nation) where it crosses the river on the Pont de Bir-Hakeim. The line uses rolling stock with pneumatic tires to reduce noise where the trains run on elevated track through residential neighborhoods. The views of the nearby Eiffel Tower (out of the photo to the left) are spectacular from the train as it crosses the river. The bridge was completed in 1905, replacing an earlier bridge to accommodate the then-new métro crossing. Pedestrians and motor vehicles use the lower deck, while the métro runs on the upper level viaduct. Despot Housewives, Dictators' Wives? Is that a thing? Jeez. This week's big news is the release of the new movie "Everest" in theaters on Wednesday. Josh Brolin, Jake Guyllenhall, and Jason Clarke (who's he?) mess around in the snow. Oh yeah, and the American Emmy Awards are on. 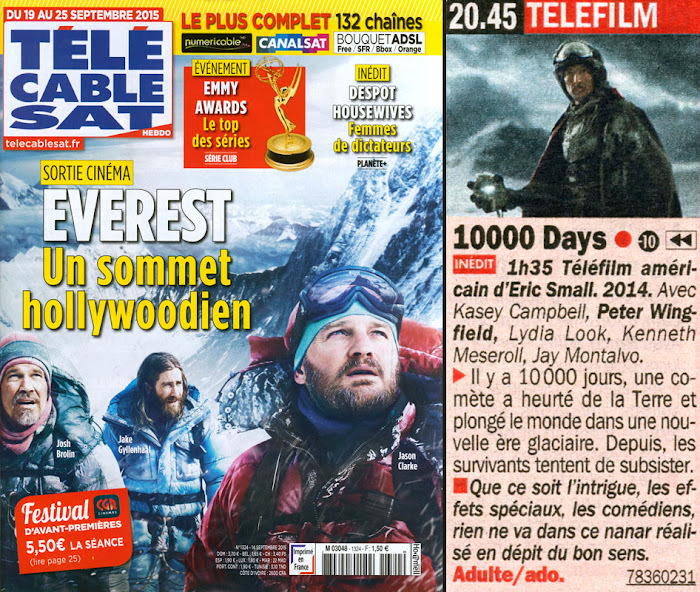 And to go with "Everest," we have 10,000 Days, a disaster of glacial proportions, apparently. By the way, the word Inédit in the red box means that this is the first showing of this program (on this channel, anyway). 10,000 Days. American made-for-tv movie. Directed by Eric Small, 2014. With Kasey Campbell, Peter Wingfield, Lydia Look, Kenneth Meseroll, and Jay Montalvo. ► Ten thousand days ago, a comet collided with Earth and plunged the world into a new ice age. Since then, the survivors struggle to subsist. Be it the plot, the special effects, the actors, nothing at all works in this haphazardly directed stinker. I always wanted to try this place, but I don't think I've ever been. 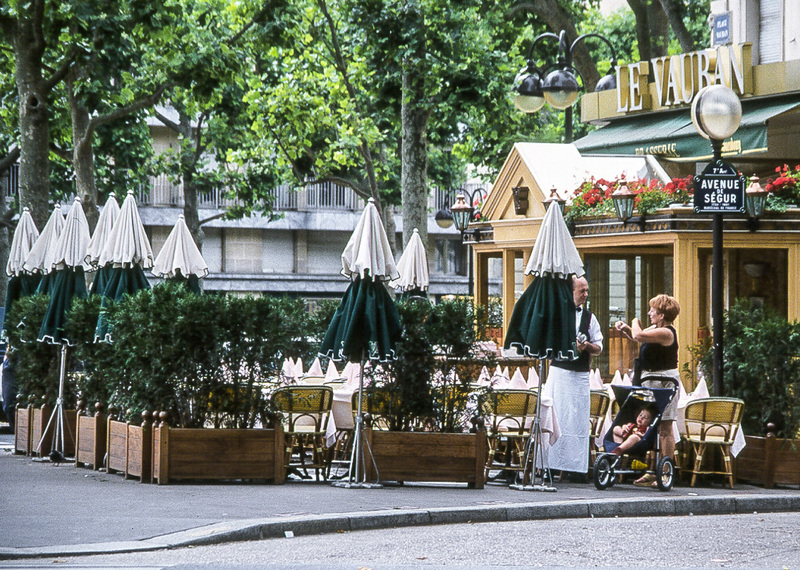 The brasserie Le Vauban is on the place of the same name, on the corner between the avenues of Ségur and Breteuil, just across from the Dôme des Invalides. To me it looks typically Parisian, especially the waiter setting up tables in his black vest and white apron. The small two-toned umbrellas have since been replaced with two expansive beige models. And the awning no longer says "Brasserie." The neighborhood is very residential and, I think, well-to-do. This photo is another from the nineties. I wonder if the place looks the same? Well, a quick look at Google Earth (street view) shows that it's been renovated and updated, but still with the same gold color scheme. It looks less upscale now than it does in my twenty-year old photo, and seems to be catering more to tourists visiting Napoleon's tomb than to local residents. Maybe it always did. Sébastian Le Prestre, Marquis de Vauban (for whom this place was named), was a military strategist, engineer, and architect under King Louis XIV. He is probably best known for his design of military forts and citadels. Vauban modernized the defensive strategies of his time and his distinctive designs would be recognizable to most Americans familiar with New World colonial fortifications. 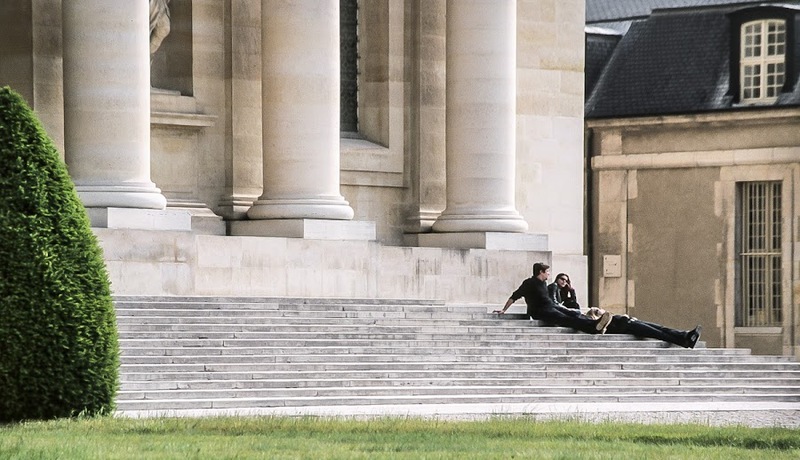 Yesterday's photo was a close-up of a small portion of the Dôme des Invalides in Paris. So today I thought I'd post a much wider view, seen from the other side and across the river to the northwest. The dome of the church is prominent, as is the ornate bridge, le Pont Alexandre III, which connects the Esplanade des Invalides on the Left Bank to the Avenue des Champs-Elysées on the Right Bank. Napoleon's tomb is under that dome. As I've been doing with these old slides, I'm trying to improve them with Lightroom software. This one came out a little contrasty, with the blacks becoming very, very black. But I think it's okay. The original photo was a little too washed out above the bridge line. Stoop is a funny word. The region where I grew up was once a Dutch settlement and colony, and our vocabulary is peppered with words of Dutch origin. Stoop is one of them, meaning the small set of steps that lead up to a building's (usually a house's) front door. The stoop was a good place to sit and hang out, slightly above street level and out of the way of foot traffic. Parisians, like most hip urbanites, wear black. Until something darker comes along. I wouldn't call these steps a stoop, although the photo reminded me of hanging out on one. These columns are part of the southeastern façade of the Dôme des Invalides, the centerpiece of the massive Hôtel des Invalides complex built by Louis XIV in the seventeenth century, and the final resting place of Napoleon Bonaparte. It's one of the more recognizable monuments in Paris, although maybe not from this picture. It's weird to go into media blackout, even if it's for less than twenty-four hours, not reading blogs, newspapers, or watching television news, all to avoid hearing who won the men's final in New York. But it worked. I had a good time watching the match yesterday afternoon. I must admit, I was rooting for Roger, but Novak played very well and Roger stumbled a bit. Still, a good match. 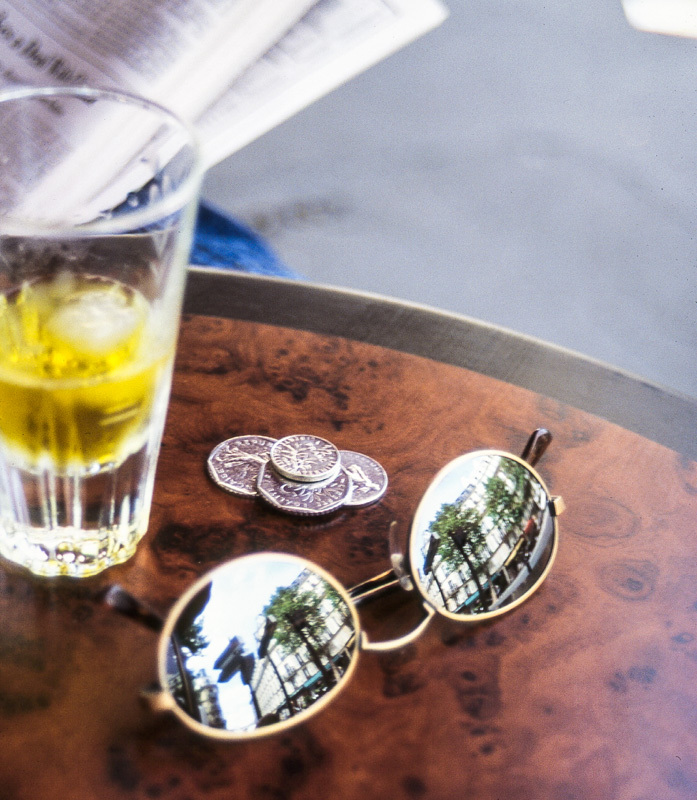 Having a drink in the Latin Quarter in the '90s. Those are French Francs on the table. Now everything's in Euros. I had a little trouble with the recording. The match started much later than I expected and, even though I programmed a bunch of extra time, my recording ended about half-way through the match. Fortunately, the channel that broadcast the match over night was repeating it yesterday afternoon, and I was able to pick up just about where my recording ended and finish watching. Very lucky. 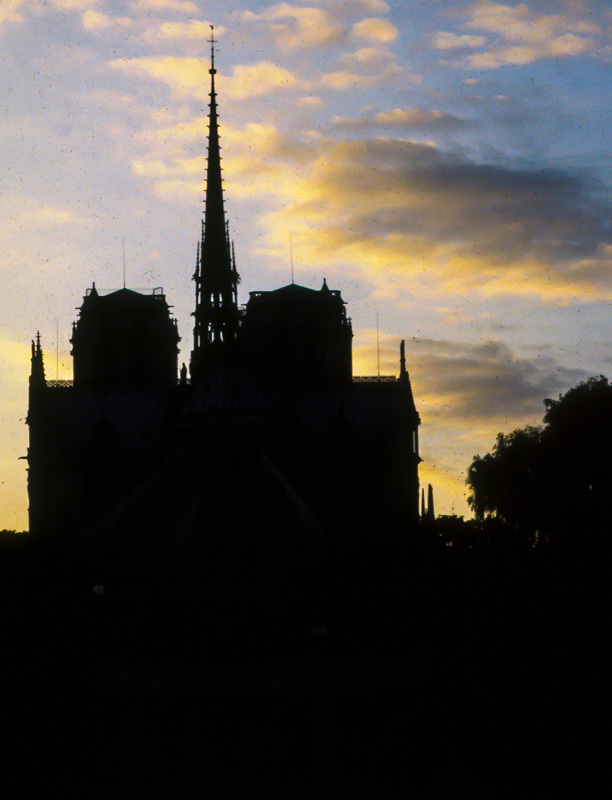 Here's another photo of the cathedral of Notre Dame de Paris, this time silhouetted against the setting sun. Again, it's a scan of a slide I took around twenty years ago. 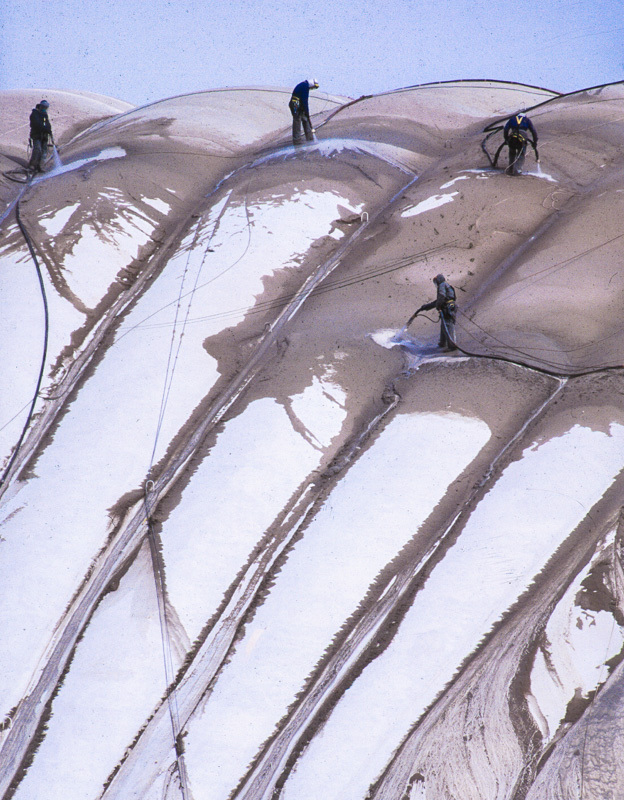 I'm enjoying redoing these old slides once again. It's nice to see old photos and remember the trips we were on. And it's nice that they can be re-worked and given a second, even third, life. I am in media black out this morning so that I don't find out who won the US Open men's final. I've recorded it over night and will watch it later today. Don't tell me! I don't think there is any such place in France, officially. 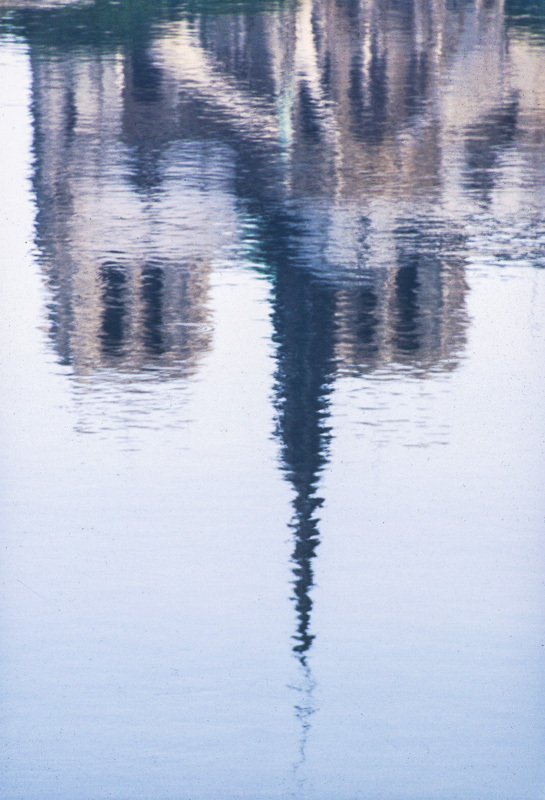 The cathedral of Notre Dame de Paris sits on an island in the river Seine and in certain places you can see its reflection in the water. That is, unless the almost constant boat traffic makes too many waves. I was lucky with this shot; the ripples in the water made the reflection look like an impressionist painting. I bet it would be a cool night shot, too. This is another one of those color slides that I took around twenty or so years ago, digitized and improved with Lightroom software. 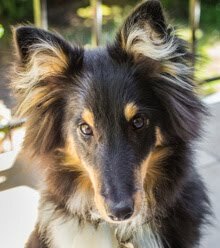 I'm sure I've posted another version of this photo back in the early days of the blog, but it was in a much smaller format. Rugby World Cup! It starts up toward the end of the week; France plays Italy on Saturday next. Our television program has a profile of France's team, a review of the top five national teams, and the full schedule of televised matches. I like rugby, but I don't watch much, usually because I'm watching tennis. I also have still not really figured out the rules. But it's fun to watch! World Rugby (15 players/team), not to be confused with Rugby League (13 players/team). This week's bomb has Christian Slater in it, which surprises me because I normally like the films he's in. Oh well, I suppose everyone has a bad day now and then. Or, just don't make a movie where the director's last name is the same as your first name; leads to confusion. The film's English title is "Stranded." Invasion sur la lune (Moon Invasion). Canadian/British made-for-tv movie. Directed by Roger Christian, 2013. With Christian Slater, Brendan Fehr, and Amy Matysio. ► A moon base, partially destroyed by a meteorite shower, is invaded by an extraterrestrial life form. A bomb in which Christian Slater attempts, unsuccessfully, to make us overlook a stupid story line and less-than-convincing special effects. For adults and teenagers kids over 12. 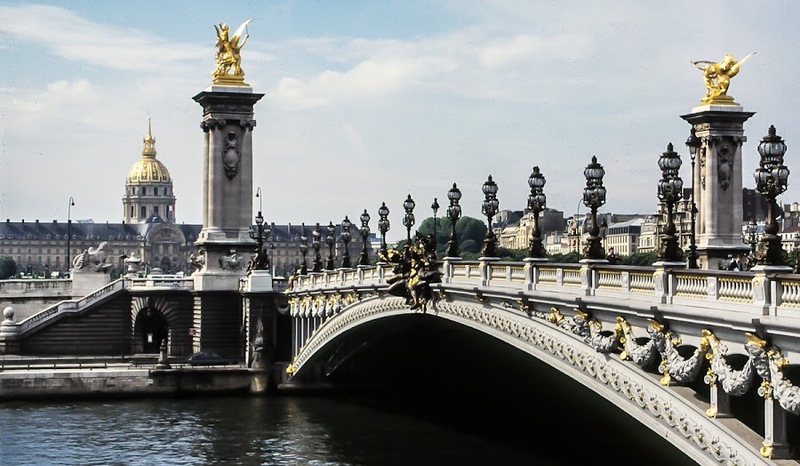 For many Parisians, the Seine and its banks are part of their back yard, a place to rest and relax away (enough) from the hub-bub of the streets above. It's even more of a haven these days since the river is getting cleaner every year and many parks and green spaces have been developed along the waterfront in the past decade or so. And each August since 2002, a long section of the right bank's riverside expressway is closed and covered over in sand to make a "beach" for people who can't or don't get away for a seaside vacation. Hanging out on the river, 20 years or so ago. I don't remember exactly where I took this picture. It's one of the islands, either Cité or Saint-Louis, and it's the south side as seen from the Left Bank. That's as precise as I can get without going to find the spot again. Le Centre National des Industries et Techniques (CNIT) was inaugurated in 1958, the first building to be constructed in what would later become Paris' modern new business district at La Défense. The building's shape was determined by the triangular plot of land it occupied. Three enormous concrete footings were poured to support the undulating vaulted concrete roof. For twenty or so years after it opened, the CNIT's large triangular space under the vaulted roof hosted trade shows and conferences. I think I was standing on the steps of the Grande Arche de la Défense when I took this. In 1988, the building, now surrounded by office towers and a vast public plaza built over a network of subway and rail stations, was gutted and renovated. It was re-opened as the Centre des Nouvelles Industries et Technologies (still le CNIT). Office buildings and a hotel were built under the roof, totally transforming the space that was deemed insufficient for modern trade shows. It was after this renovation that I saw the interior -- the only time I've been inside the building -- and when I took this photo of the roof being power-washed. The building was renovated again in 2006, still with office buildings inside, but re-built to better highlight the original vaulted roof and to improve connections to the outdoor plaza above and the pedestrian corridors and rail facilities below. I feel like I should go back and see it again the next time I'm in Paris. Ken has been posting photos on his blog from his brief stay in Paris a few weeks ago. While working on his pictures, we researched something or other and I looked back at some of my old pictures of Paris to see if I could find what he was looking for. The photos are slides that I took more than twenty years ago (!) that I had scanned and used for some of my earliest blog posts (coming up on ten years ago, now). I wondered if I could make them look better with my new photo software, Lightroom, and gave it a try. This was originally a color slide that I decided might look good in black and white. I'm pretty happy with how some of them are turning out. Lightroom has a lot of tools that help to improve imperfections in these old images and it's much more powerful than the earlier version of Photoshop that I used when I first digitized the slides. So... naturally I'd thought I'd share some of the results. This is the rue de Bièvre in the Latin Quarter (5eme arrondissement) on the Left Bank. The little street runs from the Place Maubert down to the river at the Quai de Montebello. The view is looking south toward the Place Maubert. The dome in the background is the Pantheon, long before its recent face lift. I noticed a bunch of cars and trucks out in the vineyard on Monday. Harvesting has started in one of the parcels. It is hand-harvesting, which they do here and there, although most of the harvest will be done by machine. I don't know which varietals they were picking or even which color grapes they were. Time will tell. Red grapes on the vine, almost ready for harvest. I've picked up all of the fallen apples (except for those on the walkway) and am ready to cut the grass again. We're expecting a few more days of dry, warm (but not hot) weather before another system moves through this coming weekend. I doubt this will be the last cut of the season, but picking up apples should be less of a chore now that most of them are off the trees (thanks to that wind storm a couple of weeks ago). I did manage to save a few nice ones for an apple tart this afternoon. Last spring, Ken planted some kale and collard green seeds. We set the little plants out in the garden and almost immediately they were attacked by flea beetles. 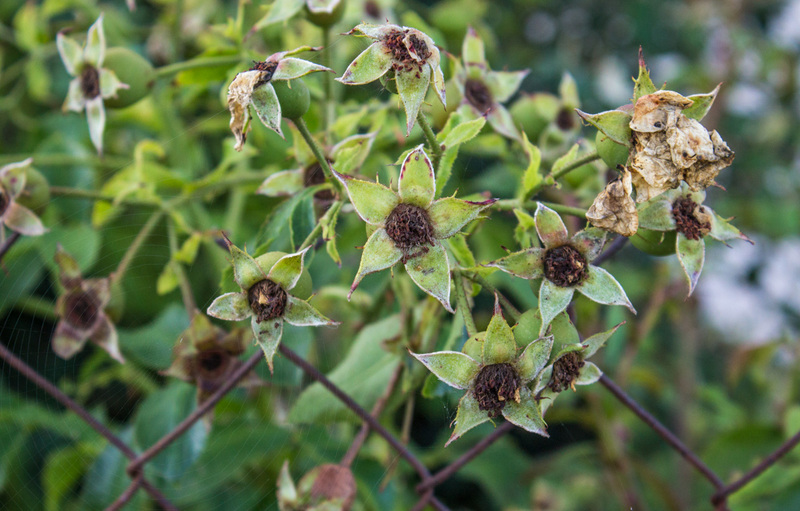 The plants were ravaged as the beetles pierced the leaves with thousands of tiny holes. I tried some insecticidal soap to no avail. We thought the plants were goners and, indeed, the kale disappeared. Nice looking collard greens. I've since cut back some that encroaching zucchini (top). Just a couple of weeks ago, as summer's dry heat wave abated, we noticed that the beetles were gone and that new leaves started to grow on the surviving collard plants. Today they look great and we're looking forward to our first harvest. 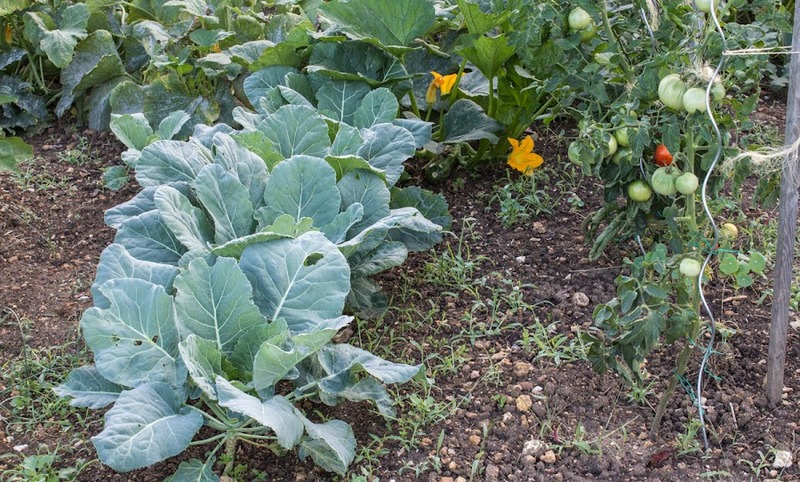 It may be time to plant more seeds for a fall/winter crop. I used my new garden tool, un racloir, to "rake" the fallen apples in our yard into little piles (it's not a rake, but kind of a very wide hoe). 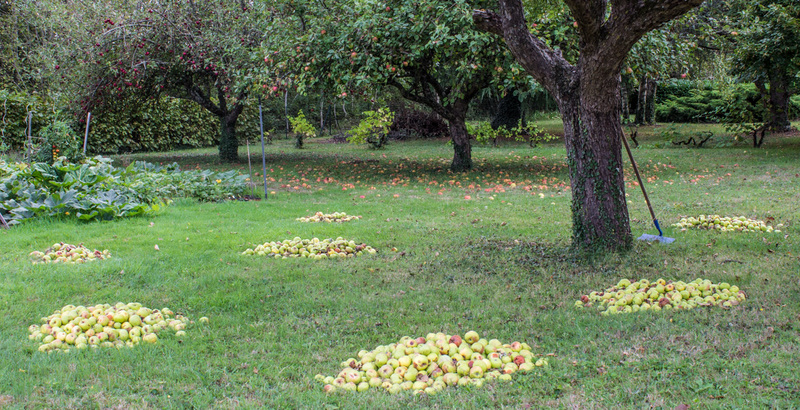 Once that's done, I can kneel down on the ground and toss the apples into a wheel barrow, which is exactly what I did to all these piles on Saturday. Today I plan to do the same with the apples under the other two trees. Then I'll be ready to cut the grass again later in the week. Each of these piles, except for the two smallest ones, filled up the wheelbarrow for 6 trips to the compost pile. The racloir is leaning up against the tree trunk. The current chilly weather is supposed to give way to warmer temperatures as the week progresses, with nothing but sun in the forecast. I'll probably be out there on Wednesday with the lawnmower. 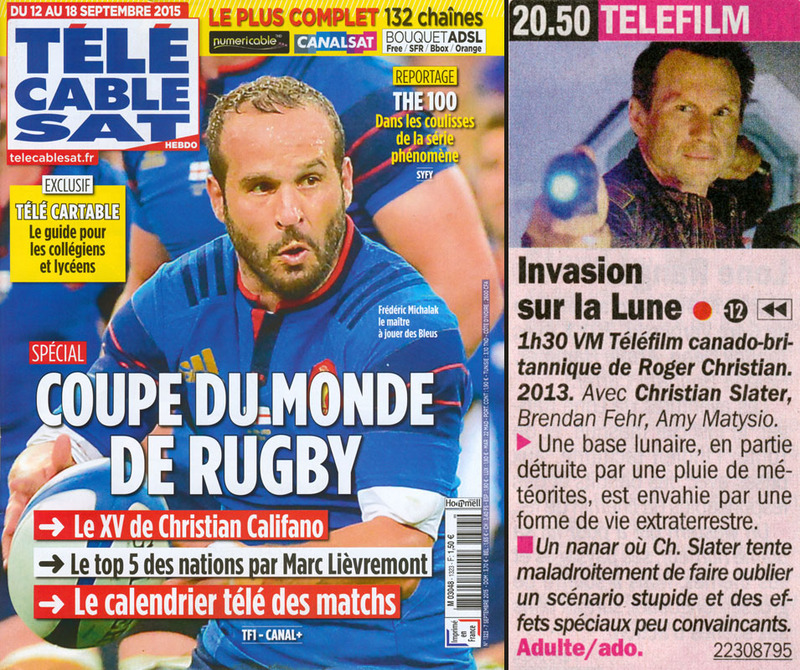 The new season on Canal + is under way and the tv program is highlighting their women presenters this week. For me, it's the second week of the US Open. The tournament is very interesting this middle weekend. Who else will stumble? Ingrid Bergman is a citizen of the world. Wait... aren't we all? I've never seen this second installment of "Basic Instinct" (I did see the first one), and was surprised to see it get panned in our tv program. A quick check on the internet shows me that Roger Ebert gave it only 1 1/2 stars and the Tomatometer at Rotten Tomatoes only registers a 7%. So, it's unanimous. Basic Instinct 2. American/British/German crime drama. Directed by Michael Caton-Jones, 2006. With Sharon Stone, David Morrissey, David Thewlis, and Charlotte Rampling. ► In London, a romance novelist meets a renowned psychiatrist who must evaluate her sanity as part of a murder investigation. A hollow screenplay and actors bordering on the ridiculous. The film's failure at the box office was scathing. For adults and teenagers over 12. 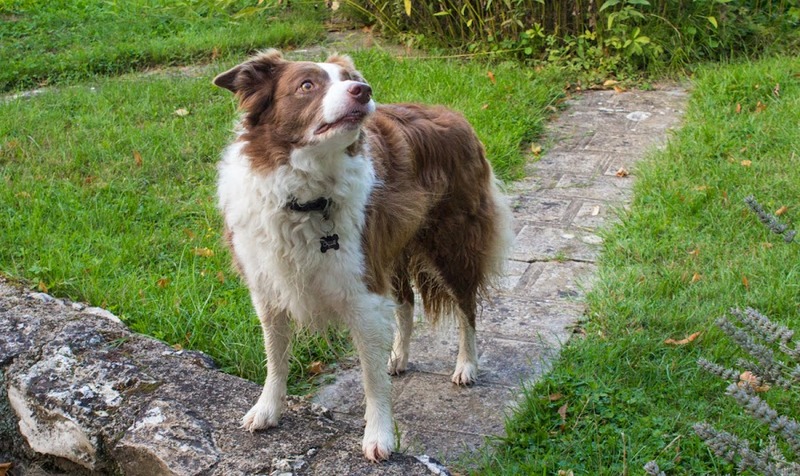 I don't know what Callie was looking at, but something on the side of the house caught her eye. I know it wasn't a lizard because it was too chilly at this point in the morning for them to be out and about. Nor was it a hot-air balloon, or the moon. She was waiting for me to open the back door as we returned from our walk. Once inside, she gets into the shower stall in the utility room and I spray the sand and mud off her feet, legs, and belly. Then she gets toweled off -- her favorite part -- before we go upstairs for treats and breakfast. Dogs love routines. The grapes are getting closer to harvest. 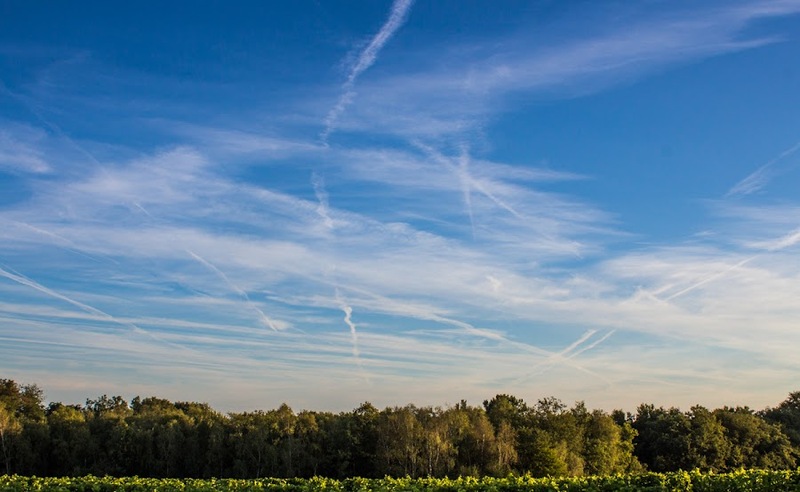 The growers have to gauge the timing based on the sugar content of the grapes vs. the weather. From my extensive research quick glance at the internet, I understand that the earliest date that harvesting can begin for AOC varietals is set administratively in each département. It's normally about 100 days from flowering, but can vary based on weather and other conditions. 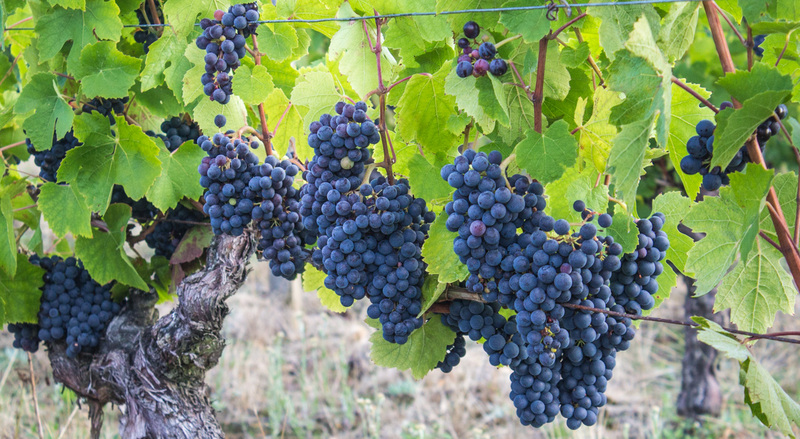 After that date, each individual grower can decide the best time to harvest his/her grapes. Sauvignon blanc on the vine about a week ago. There's just a tinge of gold on some of these grapes. Can you see it? 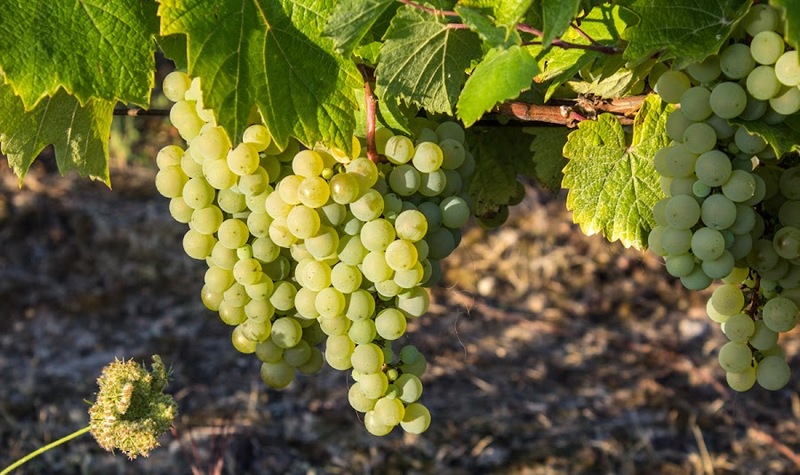 My untrained eye sees that the red grapes are close (and very sweet), and the sauvignon (white) grapes are beginning to get that golden look that they get when they're ready. The forecast for the next few days is dry and sunny, so that should help move things along nicely. Of course, it's all about the sugar content. The next week will be interesting. It seems that, with September 1, the weather changed and summer is on the way out. I'm hopeful that we'll still have some nice weather through September and into October, but I can definitely feel a change. The mornings and evenings are darker. There's the hint of a chill in the air. Spent rose blossoms in a neighbor's garden. The vines and trees are still green. It still looks like summer outside. Grape harvesting hasn't started yet. We have a lot of tomatoes and are still getting zucchini from the garden. The daily question remains: how will we eat zucchini today? Ken made a great ratatouille on Tuesday, and that used up some. And now I need to get started on picking up the fallen apples. It is time. Today is the day that most kids go back to school in France. On Monday, I went out to the grocery store and noticed that the summer traffic (especially to the zoo) was mostly gone. The supermarket's parking lot was not full, and there were no lines at the checkout stand. The summer vacation season has come to a close. All those jet trails are coming from up north, where Paris is. A rain system moved in and it's been wet most of the night. There was some thunder and lightning last evening, but nothing serious. And this morning is much cooler than it has been. We got 31mm (1.2 inches) of rain over night.